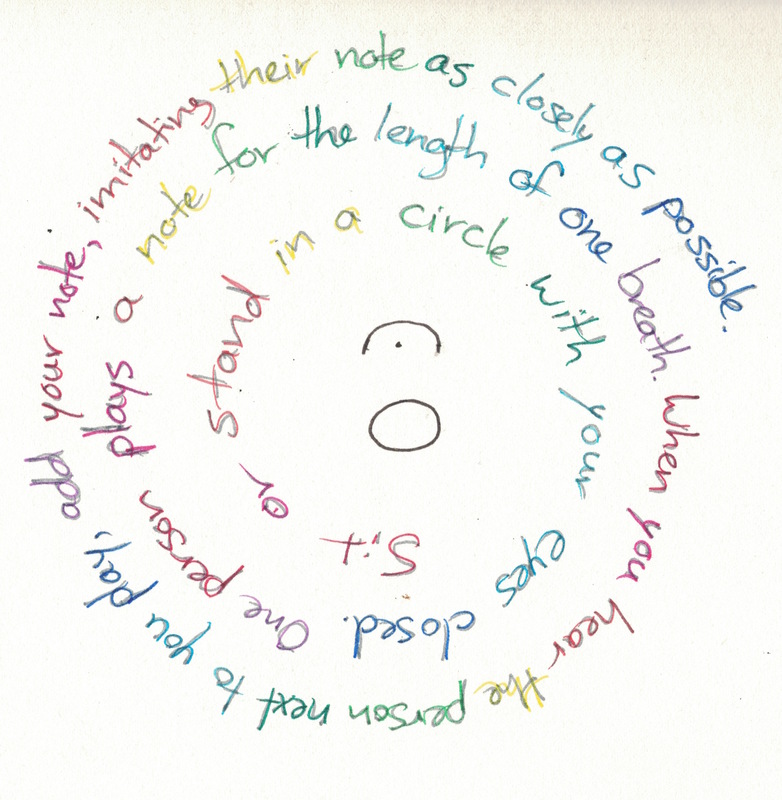 Circle games are based on the simple musical principles of repetition and variation. First, form a circle. Then, play repeat-after-me: I make a sound and everyone repeats it as a group. The task is not exact repetition of the leader. Rather, the task is to make a sound similar to the leader. Start with simple sounds. Throw in a few silly ones for good measure. Laughter keeps things light, stretches peoples’ ears and ideas of ‘what goes’, and shifts focus from ‘right-wrong’ to simply playing with sound. Sit or stand in a circle. One person makes a sound for the length of one breath. When you hear the person to your left make a sound, add your sound to theirs, imitating their sound in your own way. 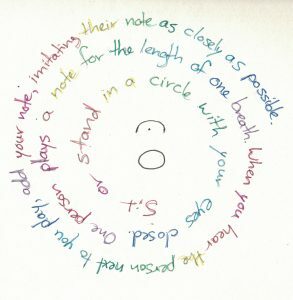 This circle game is a great way to encourage listening. I’ve been in circles of 3 people to 60 people, featuring standard instrumentations to chaotic mixes of whatever people brought or could find. The magic happens when everyone is listening and playful and the circle takes on it’s own sound and rhythm. Now that you’ve said hello, the next post will feature suggestions for in-depth conversations in sound.